More than 1 in 3 seniors in the care of others are at risk for under- or mal-nutrition (Mayo Clinic/American Dietetic Association). Malnutrition is the lack of proper nutrition, not necessarily a lack of food. Detecting malnutrition in seniors may be difficult, and even seniors who eat enough may be eating the wrong foods to keep themselves healthy. 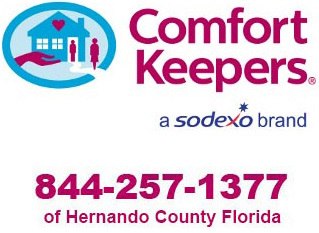 At Comfort Keepers®, we help seniors live healthy, independent lives. That’s why we have created an initiative to address senior nutrition issues. As seniors age and change, so do their nutritional needs. So keeping them properly fed and healthy makes a real difference in their quality of life. 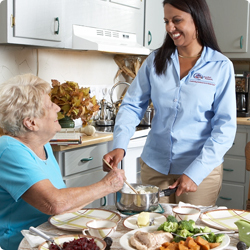 Comfort Keepers wants caregivers and family members to be aware of ways to monitor the nutrition of seniors in your care. Watch for physical problems such as poor wound healing, easy bruising and dental difficulties. Keep track of weight loss which may require purchasing a home scale or transporting to the doctor’s office for weight checks when the individual is unable to stand without assistance. Pay close attention to seniors’ eating habits and ask them to tell you where and when they eat, but don’t rely on self-reports alone. Since Comfort Keepers® often spend mealtimes with seniors at home, they may have a better idea of normal eating habits. Suggest family members visit during mealtimes which can improve a senior’s consumption. If a senior lives alone, make sure you know who is buying his or her food. Know what medications an older loved one takes and how often they can affect appetite and digestion. Use the resources available through your local retail pharmacist to check for drug nutrient interactions or possible side effects of prescribed medications. If there are medical questions regarding nutrition, medication and health Comfort Keepers® suggests seniors, their family members and other caregivers speak with doctors about tests that can help identify chronic malnutrition or other nutrition-related problems.